Developed from a circuit first introduced in 1976, the Viking 5 Metal Detector is one which has stood the test of time, and remains a popular choice for both beginners and more experienced detectorists. It is arguably one of the best selling and most successful metal detectors of all time. 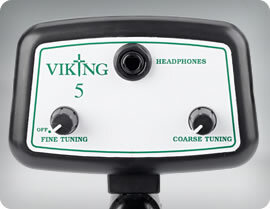 The Viking 5 Metal Detector is remarkably easy to use, having just two simple tuning controls. It has excellent sensitivity to gold, silver and copper objects, yet discriminates against small iron junk. It is often acclaimed for its ability to detect desirable objects in an area with either heavily mineralised ground or one littered with rusty iron, a feat that is often impossible for a detector costing many times the price. Along with an excellent record for reliability, these are reasons that this metal detector has established itself so successfully within the hobby. Working well on both inland sites and the beach, this metal detector represents excellent value for money.